Provided photo SFC Aaron Weaver, center, stands with, left to right, CSM Steven Stormes, LTC David Swisher, Col. Daniel Shank, and CSM Roger Jones during his induction into the Ohio Army National Guard Recruiting Hall of Fame on Monday, April 1 in Columbus. 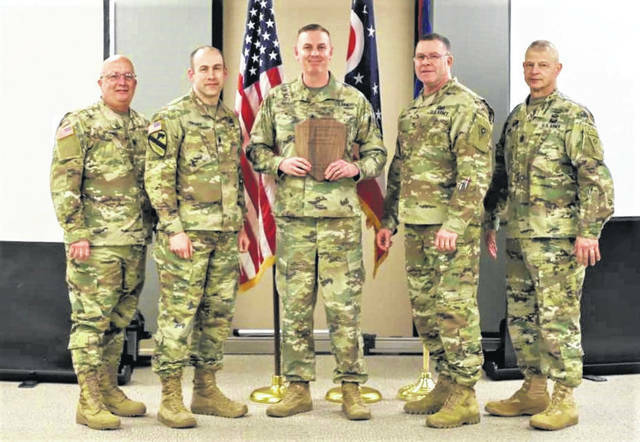 COLUMBUS — The Ohio Army National Guard has founded a new Recruiting Hall of Fame, and Miami County’s own SFC Aaron Weaver was recently chosen as one its first inductees. Weaver was the first of four recruiters to be granted “diamond level” induction in the Ohio Recruiting & Retention Battalion Hall of Fame. The induction ceremony was held on Monday, April 1 at the Defense Supply Center in Columbus. In November 1998, Weaver enlisted in the United States Army during his senior year at Troy High School. Weaver went to basic training and was stationed in Fort Sill of Oklahoma to work at the artillery school. In 2002, during the final year of his 4-year contract, Weaver was selected to be an army recruiter and was offered the opportunity to come back and recruit out of Piqua. “I wanted to stay here and pay back the community, so I switched over to the Army National Guard,” Weaver said. Weaver left Miami County in 2005 to work in the Army ROTC program at Wright State University, where he worked for six years. He then worked in recruitment throughout south Dayton for two years, and recruiting operations for the state of Ohio in Columbus. Weaver has been back recruiting in the Miami County area since 2014, and has now been recruiting for 17 years. Weaver exclaimed that each of his 264 local recruitments came with an endless number of professional options for each individual. Of his position, Weaver emphasized the importance of steadfast honesty and integrity with those who pass through his office, as they will continue to be members of his community in the years to come. In attendance with Weaver at Monday’s induction ceremony were approximately 130 other Ohio recruiters, CSM Steven Stormes, CSM Roger Jones, battalion commander LTC David Swisher, and assistant adjunct general for the army Col. Daniel Shank. According to Weaver, the award will be given annually based upon longevity in the command and number of enlistments. Weaver resides in Troy with his wife, Nicole, and their three kids. For information on opportunities with the Ohio National Guard, contact Weaver at 937-214-1133 or www.aaron.m.weaver6.mil@mail.mil. https://www.tdn-net.com/wp-content/uploads/sites/21/2019/04/web1_Weaver-1-.jpgProvided photo SFC Aaron Weaver, center, stands with, left to right, CSM Steven Stormes, LTC David Swisher, Col. Daniel Shank, and CSM Roger Jones during his induction into the Ohio Army National Guard Recruiting Hall of Fame on Monday, April 1 in Columbus.